Just before spring launched itself with warm days and balmy breezes, the little red-headed boy had his 1st birthday. The weather was perfect for a day in the garden with Bat Boy & several fairies, all accompanied by fairy bread, chocolate crackles and huge bubbles. And of course a wonderful birthday cake. 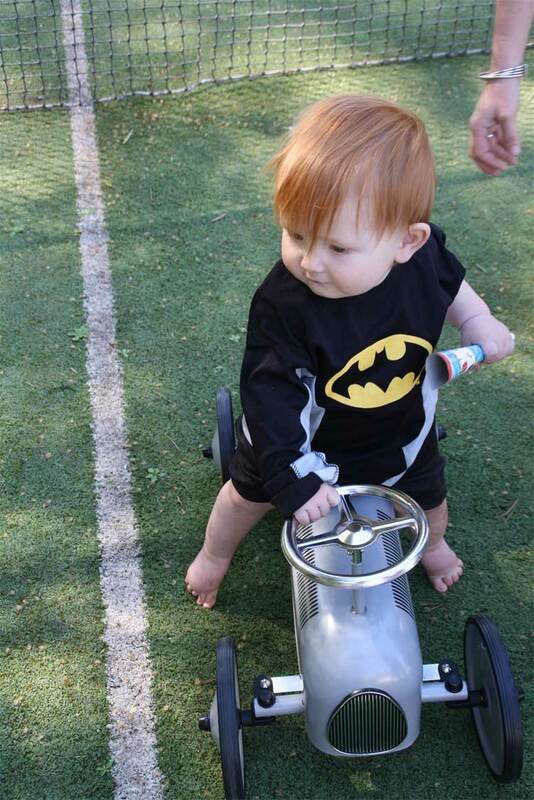 Toes barely touching the ground, he loved his new hot rod and was heard to say "brooom brooom". Truly his father's son. Spring has gone to the heads of the birds and the dawn chorus starts with the kookaburras, followed by magpies, currawongs and the smaller birds. Listen to some bird song here.The chook yard is popular with a family of Satin Bower Birds who appreciate the delivery of food each day, and I'm trying to keep the parrots at bay by putting out seed far from the chooks. Rainbow Lorikeets and Sulphur Crested Cockatoos are rife but I'd like to win over the wonderful Yellow-tailed Black Cockatoos, who are less sociable, at least in our garden. Or perhaps less greedy. A favourite bird in the garden is the Tawny Frogmouth, often confused with owls but more closely related to the nightjars, and a night hunter. By day they sleep in our pear tree, very close to the action in the busiest part of the garden. When things get too noisy (usually from the sandpit where 3 children are playing), one of the pair will ruffle feathers, open one eye, and give us 'the look'. This is mating time so I imagine ours will have a nest somewhere perhaps a little more private. They mate for life so I hope they stay safe. 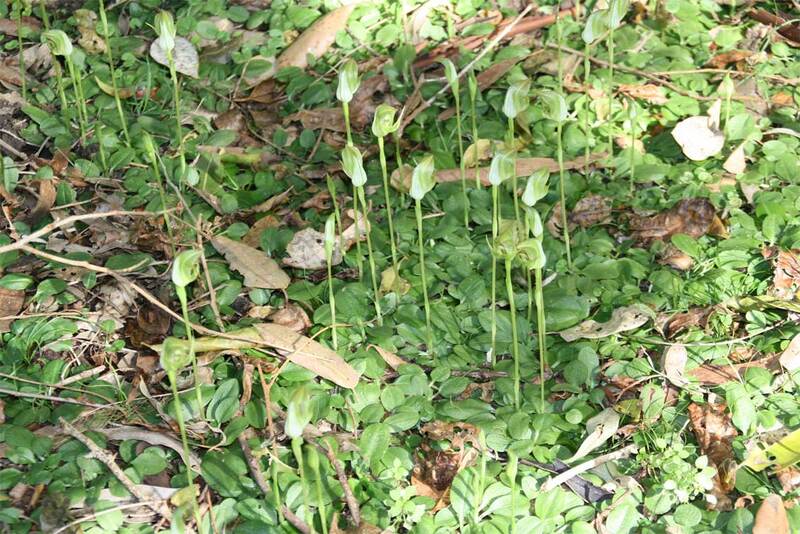 One other springtime delight is the appearance of Nodding Greenhood ground orchids which completely disappear for most of the year but suddenly produce flat leaves from which these tiny orchids emerge. They don't last long, but are just one of the ephemeral joys of gardening. 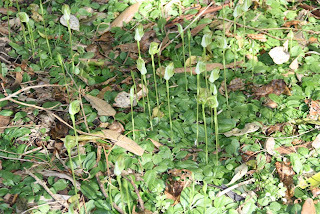 This year the patch is bigger and another has appeared a few metres away. I'm told that if I want to move them I should wait until the leaves disappear and then dig up some tubers but I feel this would take away some of the mystery. I rather like the way they come and go with no help from me. I've been very slow to post and I intend to bump up my frequency. Part of my problem is that I intended this blog to be about book arts - and at the moment I'm in a slump. So for a while I'll just try talking about things I'm doing, bookish or not, and add some photos as I go. Thank you to all those who have persisted in reading my posts, in spite of their irregularity. I love to read your comments and would like to know what you think. I'll reply to your comments here and of course visit you at your blog as well. Love the "froggies" in your garden! And I miss the currawongs. Oh well, I have drongos year-round here and the koels have been singing their heads off since Sunday. And yesterday I had a kingfisher-inside! Managed to get it and release it before the Black Rascals could get it. Oh I must go and look for our greenhoods, I have been confined to house and car far too much but more rain is forecast, so perhaps I wont be going too far away. This is a lovely post Carol! And I have learned so much - I didn't know that tawny frog mouths weren't an owl! They are gorgeous tho' and I love any owl-ish bird. Those eyes, I laughed out loud when you mentioned "the look". I think it would be delightful to hear more about your life in general, especially if it helps to lessen the pressure to make something bookish that you deem blog-worthy. as well you know, I like lots of things other than book art (or any arts!) so I say - let rip with the bird and kiddie tales! Oh, what a lovely lot you all are. Thanks for your encouragement & advice. Di: No drongos but the koels should be here any day now. Lucky kingfisher! My friend Judy in US had a hummingbird inside her studio - we do love our birds, don't we? Penny: So pleased to hear someone else loves Greenhoods. Go out and have a look! Amanda: I laugh too, when I see "the look". 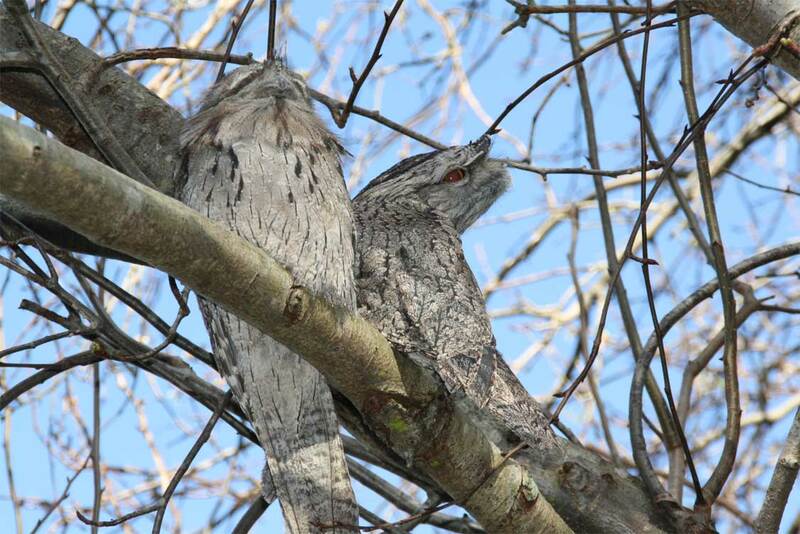 I hope they have a nest, I'll have to get the binoculars and do a search. I'd love a photo of mum, dad and baby. Ronnie: Hmm, Karen won't be pleased if the bower birds take to her veggies. Okay, I'll take heed, especially of Ronnie and 'let rip' with tales of my life, and hopefully ther'll be a lot of booky stuff in there as well. what a lovely post. we don't have the owls but we do have the bower birds - noisy lot, but worse are the blackbirds who hunt our lovely little blue wrens!!! Thanks Ida, I'm hoping that by planting suitably bushy natives that we may get some wrens. At the moment the big birds are too stroppy for small birds to feel safe. OMG!! he's the cutest batboy ever!! !